“Tie-dying” paper is a fun and easy project. And, chances are, you already have everything on hand you need to do it. Squirt the bottom of the pan with shaving cream as shown. Spread the foam around evenly. I’d suggest using your hand for this step because it feels cool! Drip several drops of food coloring into the foamy mess, like so. Don't be afraid to experiment with color! Place your piece of paper into your colored foam. Press slightly with the palms of your hands. Lift out, or rather, peel off paper from foam. Now, using a paper towel, dab the paper. You can disperse color this way too, putting color where your paper didn’t pick up any foam. It’s sort of like sponge painting. Finally, wipe off the remaining residue with a paper towel. Rinse towel, wring out well, and swipe paper again, if necessary. Note: your paper will smell like shaving cream, but the scent will fade after a few days. As I will be using my paper for origami, after it dried, I ironed it with a hot, dry iron. This brought a smile to my face. What an absolutely charming way to use shaving cream! Thanks also for the upload. Love it. Check out my link for one of the papers I made. It looks like a marble counter top! Is it possible to use the same technique on butchers paper? I want to turn the butchers paper into christmas wrapping paper. Meghan--Glad the technique turned out so well for you! And congrats on gettin' hitched!! I used this technique for my wedding invitations and they turned out awesome! I had many compliments. I enjoyed it so much, I also did this project for my Demonstrative Speech in Public Speaking. Awesome idea!! Awesome! yet one more cool task to work on with my students! I'm quite excited! 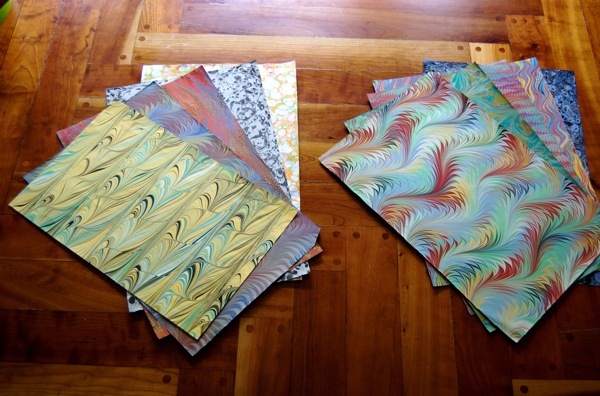 Uh huh, and how did you make the marbled paper, pray tell? rebecca--That's a very good question! If I were to try it, I think I might use white wallpaper. I'd cut the paper into the desired shapes and then dip that into the shaving cream/food color mixture. Then I'd shoot it with some sort of fixative so the color wouldn't wash off when applying the flowers. Another method would be to use pre-purchased tie dye fabric, or diy-ed tie dye; cut it into the flower shape and then apply them to the walls. Here's a link describing how to apply fabric to walls. Sounds pretty easy! I'm not sure about paint. Maybe. If I were to try it, I'd probably use an inexpensive acrylic craft paint. And as for fabric dye, that would work, but it's an unforgiving medium. (Meaning it'll ruin anything you get it on you don't want dyed.) But using the same technique to tie-dye fabric...it might work. can u use paint instead of food coloring? Would this work as well with tie dye for fabric instead of food coloring? I think it looks very pretty when it is done ! I have to try doing this project it is so cool!!!!!! I love this! I am the admin of a online mommy magazine. Can I use your image and link back to this page for instructions, giving you credit of course? You're welcome! Making paper is something I haven't tried yet...one of these days!